The turkeys are good sized this year. They are getting to the point where some of the males will tussle with each other. 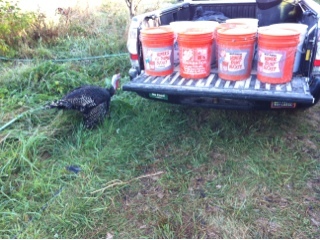 They all gobble at once when they hear a sound or see one of us heading toward them. One turkey was being picked at by the others. For several days he was removed from the pen and returned after dark. 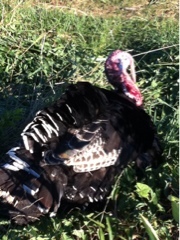 Yesterday he became a turkey that is ready for someone to cook this week. These turkeys are Broad Breasted Bronze, a beautiful, good sized, able to take care of itself kind of bird. 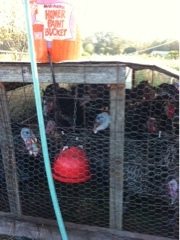 We grew them a few years ago, the year the pigs got out and opened the latches on every turkey pen. The grain bin has been a back saver. We used to take delivery of feed in 80 pound bags, which was fun for about a minute. Unwieldy, slippery and way too heavy. Made of woven plastic that just slid around when we tried to stack them. Or load into the truck. When empty the wind would pick up a bag and then we had to chase them. Last week we had huge winds blowing through here, and no problem with the grain bin, it is solidly in place. Every week we were setting out a garbage can full of plastic grain bags, now we just use buckets. A dramatic reduction in the amount of trash leaving the farm each week.